We believe that the remembrance of the holocaust is critical to create the future we want. In India – in comparison to the West – the awareness about the holocaust is less owing to various well-documented reasons. The Holocaust Awareness Campaign endeavors to change this and raise awareness about the circumstances that led to the holocaust and the historical context of the holocaust. 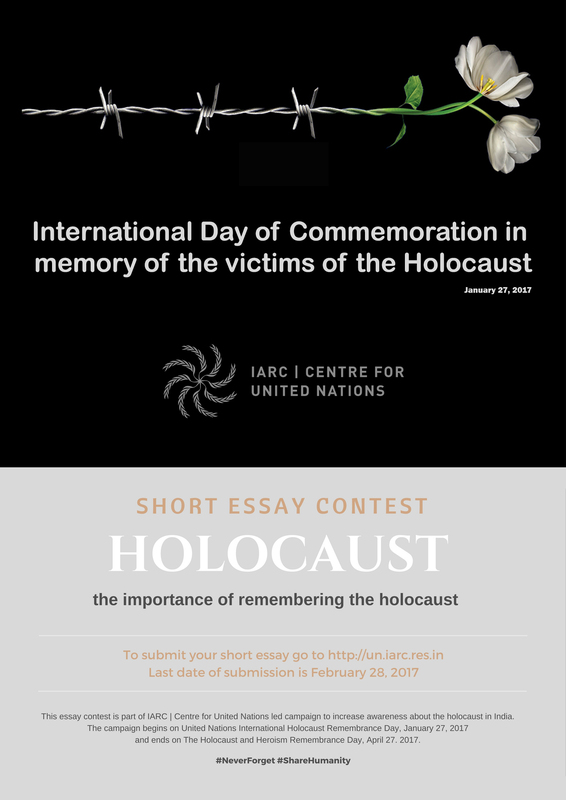 Holocaust Awareness Campaign is an IARC | Centre for United Nations led initiative to increase awareness about the holocaust in India. The campaign begins on United Nations International Holocaust Remembrance Day, January 27, 2017 and ends on The Holocaust and Heroism Remembrance Day, April 27. 2017. The Holocaust Awareness Campaign is a national level effort which will work with relevant United Nations agencies and other international organizations. It consists of contests, short-term courses, lectures and film screenings. This campaign is part of our long-term mission, Dare To Be Human.